The memorial is dedicated to the memory of seven young people, including four children, who lost their lives in the Woden Floods on Australia Day 1971. On the night of Tuesday 26 January a severe and sudden thunderstorm broke over the developing suburbs of the Woden Valley. In the torrential rain and flash flooding that followed seven lives were lost. The memorial was developed through consultation with the families of the victims as well as the Canberra community. The memorial designer is Neil Hobbs of Harris Hobbs Landscapes. The stonework design and carving is by Ian Marr, based at Hill End, NSW. The four metre high standing stone features the ACT floral emblem, Wahlenbergia gloriosa or Royal Blue Bell, and engravings of the victim’s names, while a smaller stone shows a map of the site of the tragedy as it was in 1971. Seven black cypress pines planted around the memorial also serve as a marker of the location. 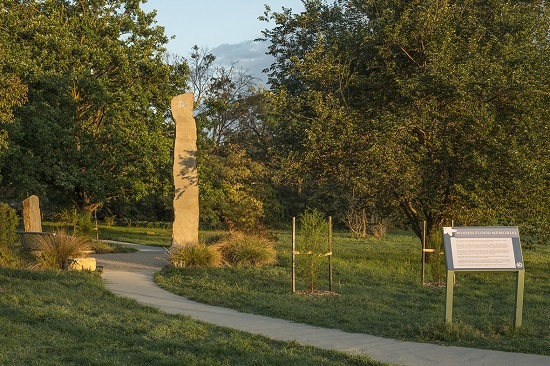 Along with the natural and carved stones, a pathway, seating and plantings provides a serene and contemplative place for visitors to the memorial. The memorial was launched by the Chief Minister Jon Stanhope, MLA, and dedicated by Bishop Pat Power on 26 January 2010.